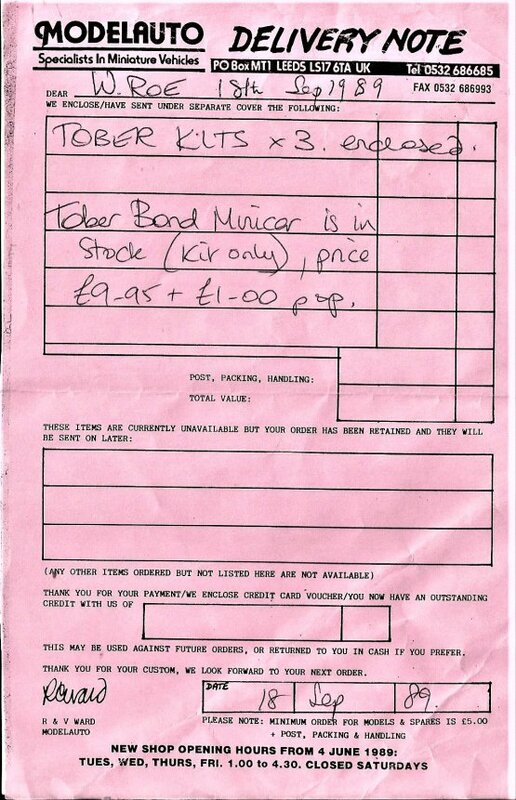 Reading through another well known model collectors journal recently I came across a letter from a reader complete with photo regarding the Tober kit model Bond Minicar, but misspelling it ‘Tobers’. 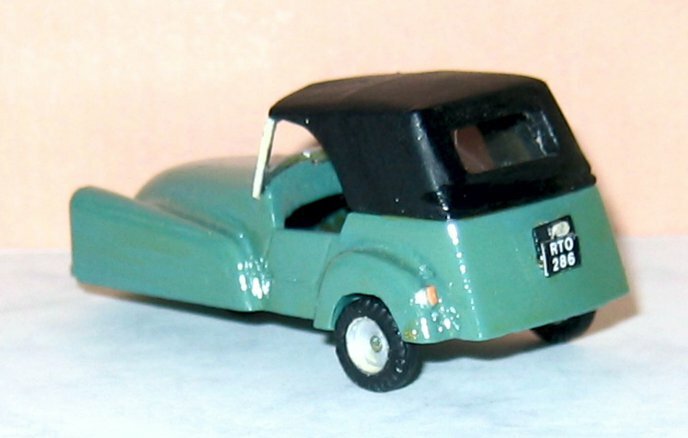 Why this was of particular interest to myself was because in my pursuit for 3 wheeler models of all types, way back in 1989, I had several of these Tober Models kits by mail order via Rod Ward’s MODELAUTO shop in Leeds. 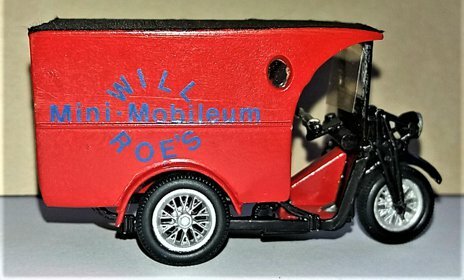 I used to take Model Auto Review on a regular basis and scanning the plethora of photos meant I could easily pick out models that suited my theme, hence that’s how these particular ones came to light. 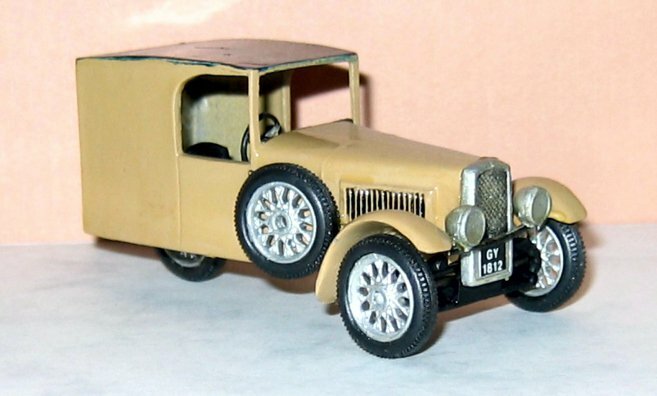 All that I know about this particular make is that they were produced by Bill Barnes of Peterborough, if they came in a box at all it was a simple aﬀair with a simple label, an easy to follow plan was included and although I haven’t measured them, I presume them all to be 1:43rd scale in white metal. 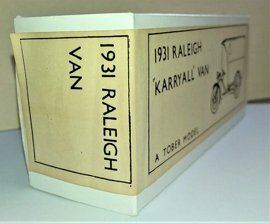 It’s only in the case of the 1931 Raleigh ‘Karryall’ van that Bill also gives a little history and explanation about the vehicle on the plan and coincidentally, that’s the only one I have a box for. [Editor: Bill Barnes made various models under his Tober Models brand and cast models for Rod Ward and for a few other small ranges as well. The name Tober comes from showman’s parlance and means the site of a fair or circus. 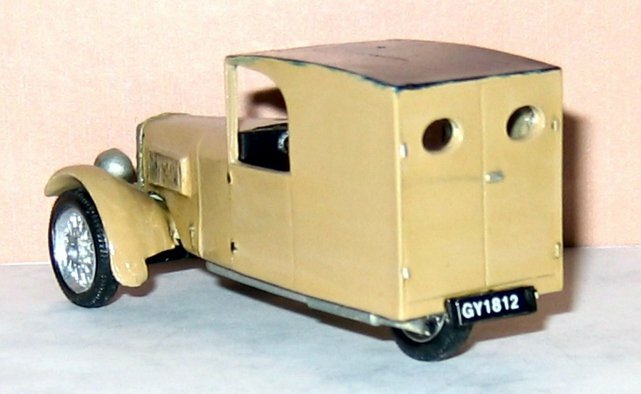 Many of Bill’s earlier models were in fact of Fairground vehicles]. So let’s have a look at what I have in my collection. 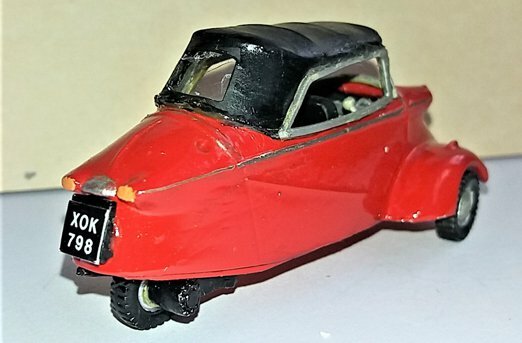 I’ll kick oﬀ ﬁrst of all with the Bond Minicar, which according to MY list of parts included (written to the left of the plan), provided either a hood up or hood down choice. I probably opted for a ‘hood-up, to cover any of my mistakes! [Editor: There was the option of open or closed to see it open see article showing my build of this kit here]. 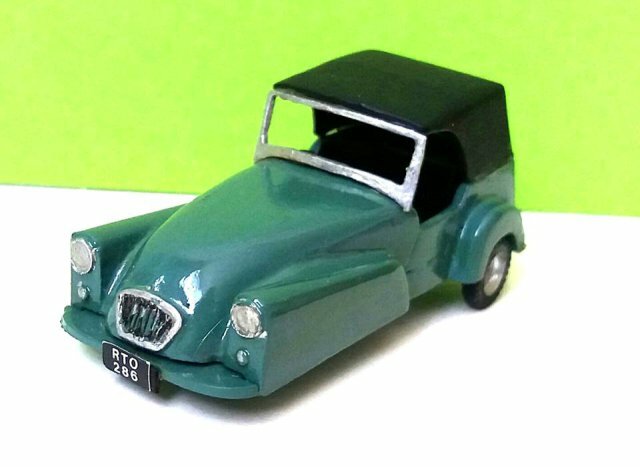 Front and rear views of my Bond Minicar model shown above. 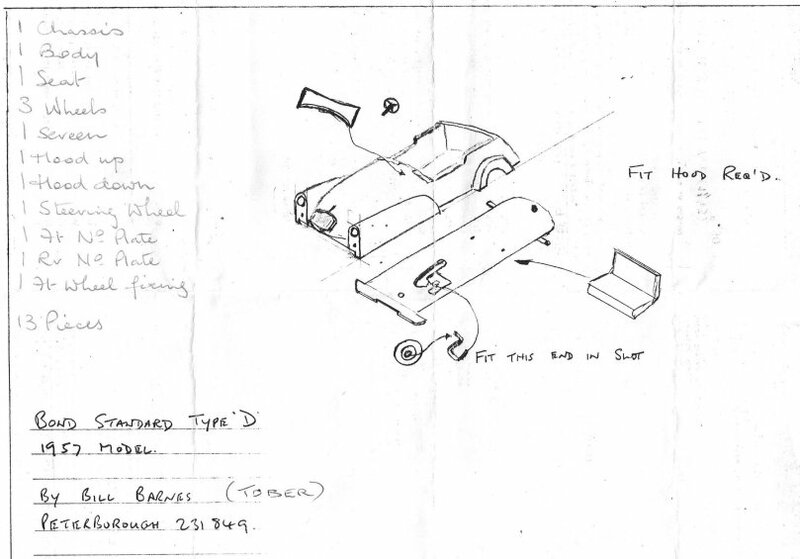 Above – the plan complete with my listing of parts on the left hand side. If there was a box with this, it has long since gone the way of such things! Next is Bill’s 1932 BSA Twin three wheeler. Once again, at the time I carefully noted down on the plan the 21 parts that made of the complete model. 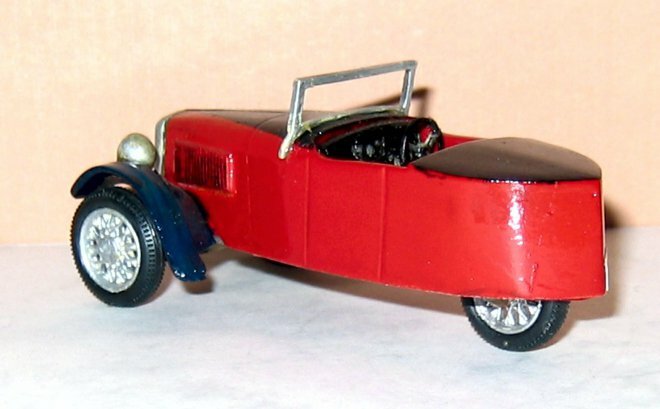 On a personal note, I’m not so sure that I would now have the patience or dexterity to handle all the small parts let along complete the painting and build. 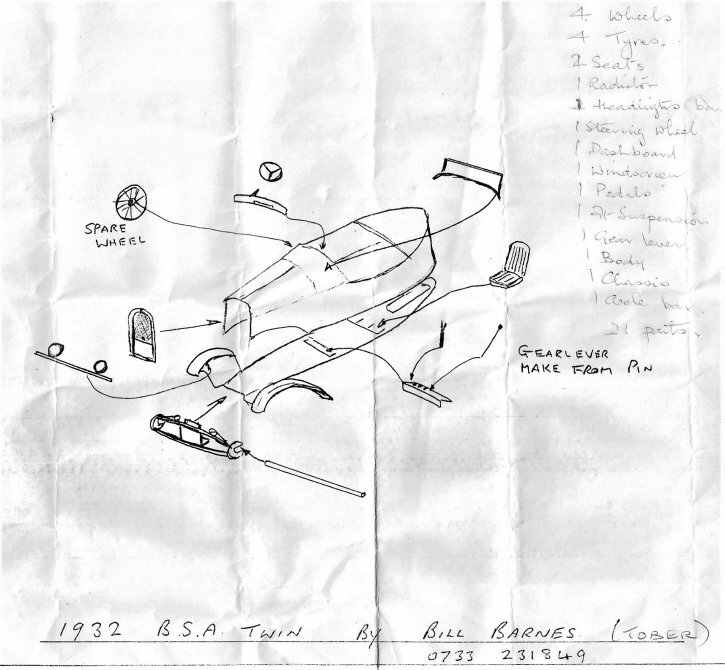 Above, the plan for the BSA Twin. 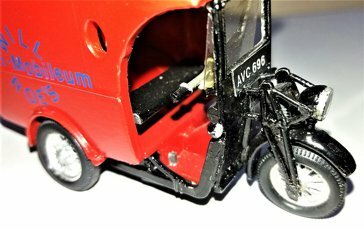 Above, is the ﬁrst delivery note from MODELAUTO order which shows that I had three more kits to be delivered. 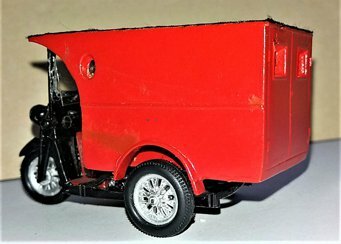 The first of Bill Barnes two commercial three wheelers, a 1931 BSA ‘V’ Twin van which this time consisted of 25 parts. Not sure how I chose my colour scheme and apologise for the sloppy roof painting! 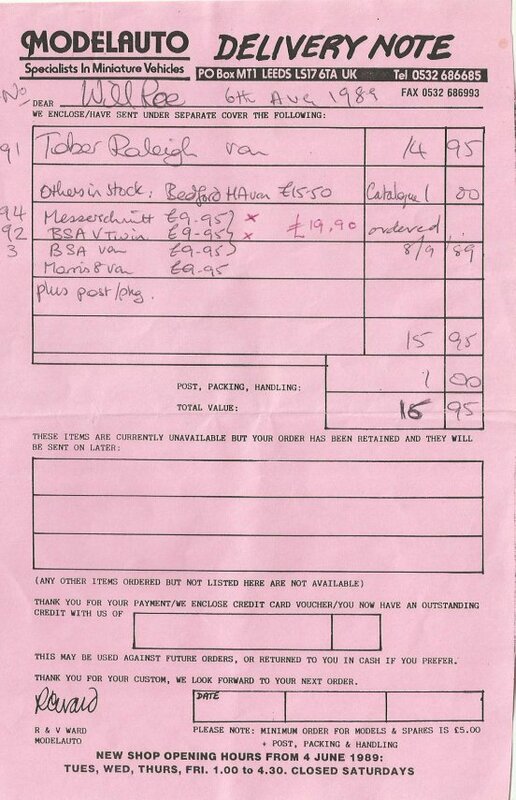 Above is the second delivery note from ModelAuto although none of this proves in what order or with what speed I constructed these kits! 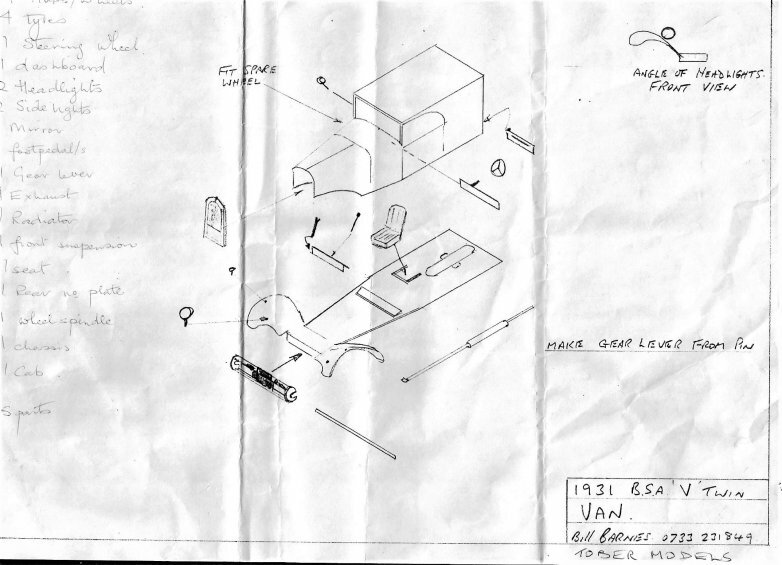 Above, plan for the 1931 BSA V Twin van which yet again sees me listing the parts, maybe to make sure that I didn’t lose any. 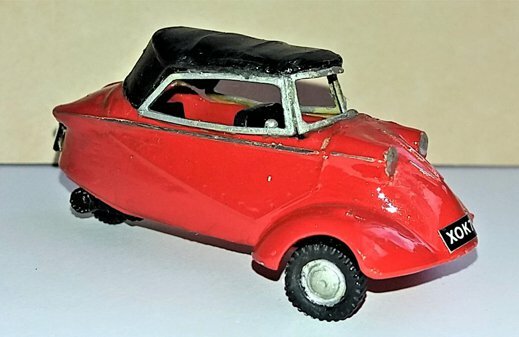 Shown below is my Tober Models Messerschmitt KR200 Kabrio in distinctive red and black ﬁnish with the soft top rather than the ‘perspex’ cockpit style side-tilt roof as fitted to many models of this machine. 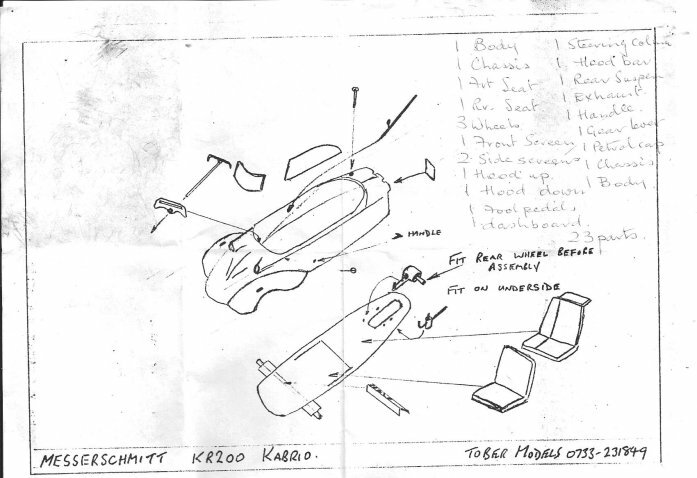 The plan sheet for the Kr200 Tober Models Messerschmitt is A5 size compared to the previously shown plans which were all A4 size. 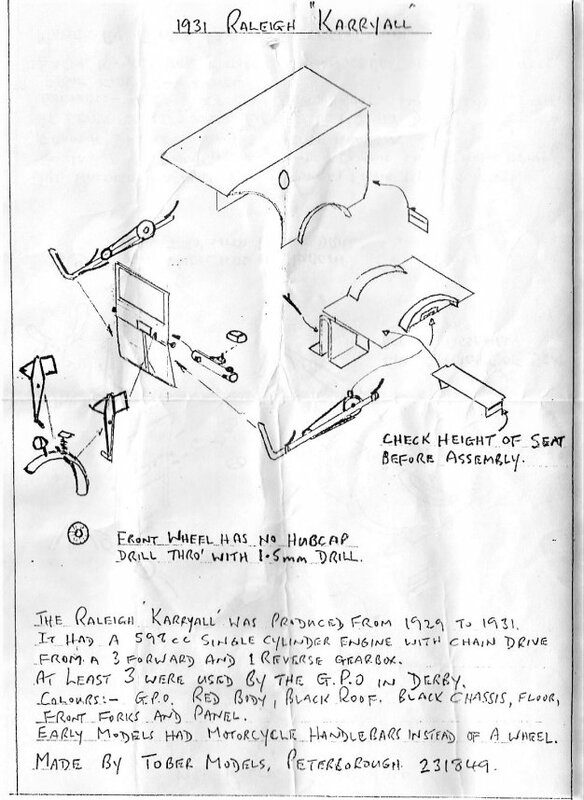 It’s interesting to note that there were 23 parts to this model against the Bond being only 13 parts, the least of any of the kits mentioned in this article. Which brings me to the ﬁnal Tober Models kit of this article. 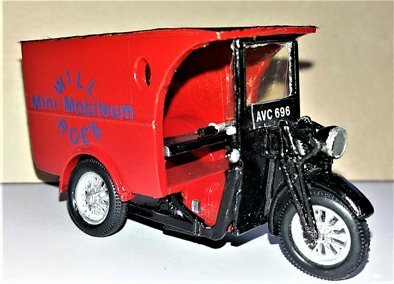 A 1931 Raleigh ‘Karryall’ van. 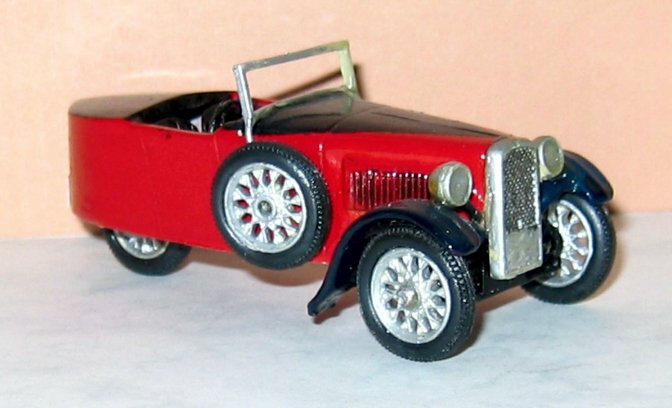 With this model, I somehow ended up with a lopsided completed model, possibly as I was having diﬃculty with the rear suspension although I followed the plan to the letter. My ﬁnished model has my own logo on one side while I left the opposite plain. If my memory serves me after all these years, I did my logo with letterset with a clear light varnish over the top. My ﬁnal two views are from the front end with a close up of the somewhat complicated forks and headlight arrangement. Bill’s plan on an A5 sheet again, as I have previously said, give a little detail about the real vehicle and is the only plan that gives list of suggested colour ﬁnish. Finally, the one and only box that I have. [Editor: It would appear that some of these models may still be available as kits from KIngfisher/Mabex as they are in the KIngfisher 2018 catalogue which may be seen on the Kingfisher/Mabex Facebook page].